Lots of work has been done in Groningen. 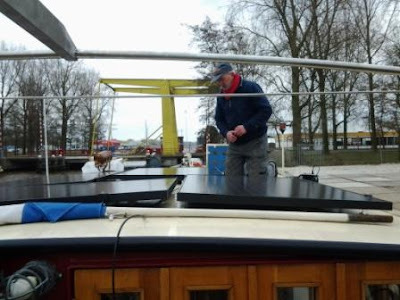 Michel was busy on the roof of the wheelhouse, in the freezing cold, to install solar panels and Willem de Vries made a new frame for the canopy. This canopy can be lowered and raised electrically, one push on the button and it goes, simple, fast and very easy. On the film below you can see how it works. Sorry the comments are in Dutch but actually it's rather self explaining, maybe I should have kept my mouth. The cover on the frame of course is new as well, we could adjust it now with all the things we found should have been better during the time we used the old canopy. What's also new is four solar panels on the roof of the wheelhouse. They make our air draught a bit higher, about 15cm, but we hope this disadvantage will be compensated by the advantage of the power, and so less use of the generator, they produce. We hope they produce a lot, practice will tell. More on this subject by the end of the season. To complete it all we have a new satellite dish and sufficient heads to listen to the radio and watch TV where ever we are, all mounted on a foot that can easily be lowered. Broke but very satisfied we are ready for take off. Tomorrow we leave Diemen and go south in search of the sun!